Well, we have now dared to eat fully blind in the dark, which is definitively a very stark experience. But it really works better than one might assume. We had feared that we would have to eat with the fingers – as how should you know when your plate is empty?! Or you end up being fully stained? This door leads into the darkness. No, not quite. As now the candles are still lit. What follows is the first course. Arthur places the plates with ease in front of us and explains us by means of clock times where is what on our plates. Unfortunately I have had a look at the website before and had seen the menu. It might have been even more interesting not to know in advance what is being served. But everything tastes exactly as it should. The first course was a salad with really delicios dressing and salmon. But though I could not tell what kind of salad it was…?! And you can feel everything quite well with your knife. So it is not necessary to recheck with your fingers. The second course is a delicate tarragon zucchini soup. But if I had not read before the menu, I would not have recognized this very special condiment. The route to the toilet is also an experience. Holding on to Arthur’s shoulder I went in polonaise march through the double door and then again into the light. The third course ist he main course. Afterwards Arthur asks the guests, what they think that they have had. “Chicken”. “Pork”. „Dog“. Arthur: “Pork-dog?“ 🙂 Well, I had chicken, mushrooms, onions, celeries, beans and roast potatoes. Sometimes a bean stray my cheek, but apart from that everything worked surprisingly well. And it was easier as I thought. It’s a pity I could not see what I was eating. …well, the dessert. Delicious banana quark with grapes and roast muesli. After that you are really stuffed. At for the last part o fit I found it quieter again. Once you are outside again, you get to know what you have actually eaten. 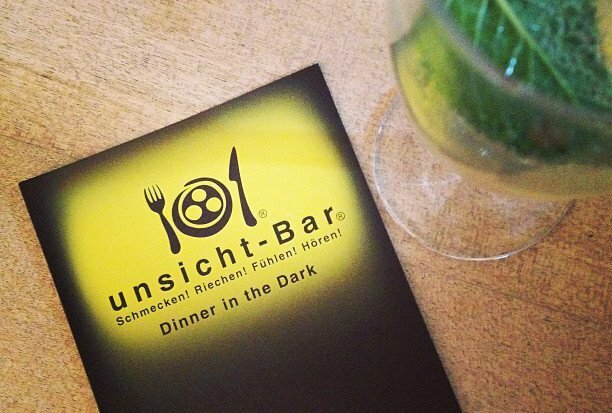 There is also an unsicht-Bar in Berlin and in Hamburg. And the Blindwalk through Cologne is for sure also interesting!